Place gnocchi in a lightly greased 9x13 baking dish. In a medium saucepan, whisk together the cream, chicken broth and flour over medium heat. Continue whisking until simmering and thickened, about 5 minutes. Stir in the salt, pepper and nutmeg. Add spinach and toss to coat. 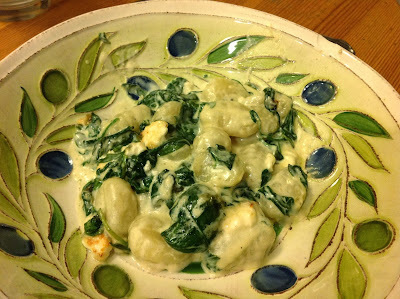 Pour mixture over the gnocchi and spread the spinach to cover. Crumble the goat cheese over the top and sprinkle with Parmesan. How many weight watcher points are in that one??? :) All kidding aside, this made me instantly hungry.